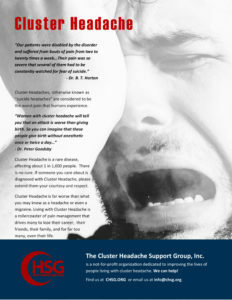 Chronic cluster headache (CH) is a rare, highly disabling primary headache condition. As NMDA receptors are possibly overactive in CH, NMDA receptor antagonists, such as ketamine, could be of interest in patients with intractable CH. Management of chronic migraine (CM) or new daily persistent headache (NDPH) in those who require aggressive outpatient and inpatient treatment is challenging. Ketamine has been suggested as a new treatment for this intractable population. A single sub-anesthetic (intravenous) IV dose of ketamine might have rapid but transient antidepressant effects in patients with treatment-resistant depression (TRD). Here we tested the tolerability, safety, and efficacy of repeated-dose open-label IV ketamine (six infusions over 12 days) in 10 medication-free symptomatic patients with TRD who had previously shown a meaningful antidepressant response to a single dose. Complex Regional Pain Syndrome Type 1 (CRPS-1) responds poorly to standard pain treatment. We evaluated if the N-methyl-D-aspartate receptor antagonist S(+)-ketamine improves pain in CRPS-1 patients. Sixty CRPS-1 patients (48 females) with severe pain participated in a double-blind randomized placebo-controlled parallel-group trial. Patients were given a 4.2-day intravenous infusion of low-dose ketamine (n = 30) or placebo (n = 30) using an individualized stepwise tailoring of dosage based on effect (pain relief) and side effects (nausea/vomiting/psychomimetic effects). Ketamine has demonstrated usefulness as an analgesic to treat nonresponsive neuropathic pain; however, it is not widely administered to outpatients due to fear of such side effects as hallucinations and other cognitive disturbances. This retrospective chart review is the first research to study the safety and efficacy of prolonged low-dose, continuous intravenous (IV) or subcutaneous ketamine infusions in noncancer outpatients.